Jamie McDonnell has been nominated for the British Boxer of the Year award by the British Boxing Board of Control. The Doncaster fighter is one of seven fighters to be shortlisted for the honour. And there is likely to be a wave of support for the 29-year-old to take the prize after two successful world title defences in America. McDonnell twice defeated former unbeaten WBO champion Tomoki Kameda to retain his WBA title, both times travelling to Texas. He is nominated alongside world champions Lee Selby, Scott Quigg, James DeGale, Carl Frampton and Kell Brook, plus Amir Khan. The BBBoC will hand out the prizes at a ceremony in London on Friday night. McDonnell’s coach Dave Coldwell has also been nominated for the newly created British Trainer of the Year prize. 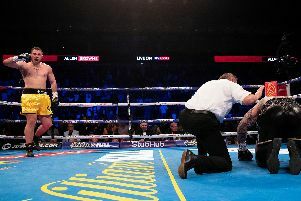 The Rotherham-based trainer – who also manages McDonnell – stepped in to help the Hatfield fighter when previous trainer Dave Hulley failed to travel to Texas for the first Kameda bout due to a crippling fear of flying. Coldwell then took on McDonnell full time and coached him through a career-best performance earlier this month. The 40-year-old also coaches McDonnell’s European champion twin Gavin and cruiserweight contender Tony Bellew.